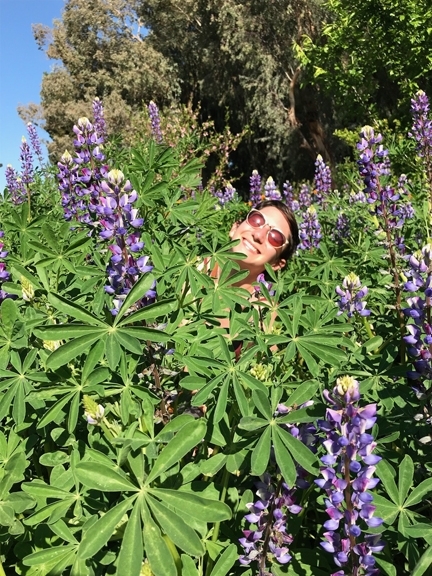 Emily Dorrance, former student project manager of the BOG, and now a BOG volunteer, peers from a patch of lupine. "A bog is a wetland that accumulates peat, a deposit of dead plant material—often mosses, and in a majority of cases, sphagnum moss."--Wikipedia. Not so with the Biological Orchard and Gardens (BOG) on the University of California, Davis, campus. 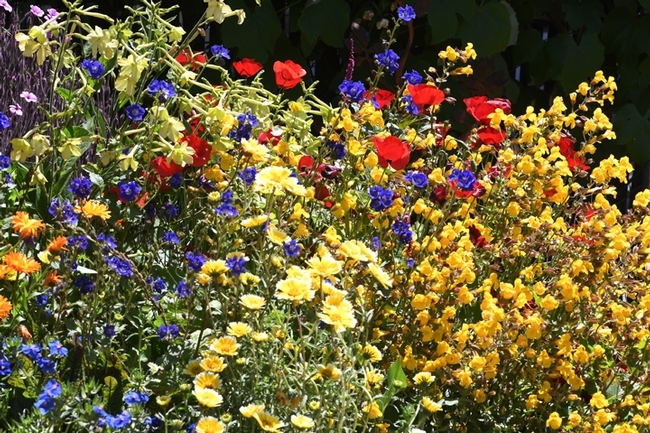 It's a 24,000-square foot treasure, a living museum planted not only with several dozen species of heritage fruit trees, but landscaped with colorful mini-gardens. This spring scores of wildflowers bloomed in awe-stopping glory, prompting passersby to pull out their cell phones and take selfies. 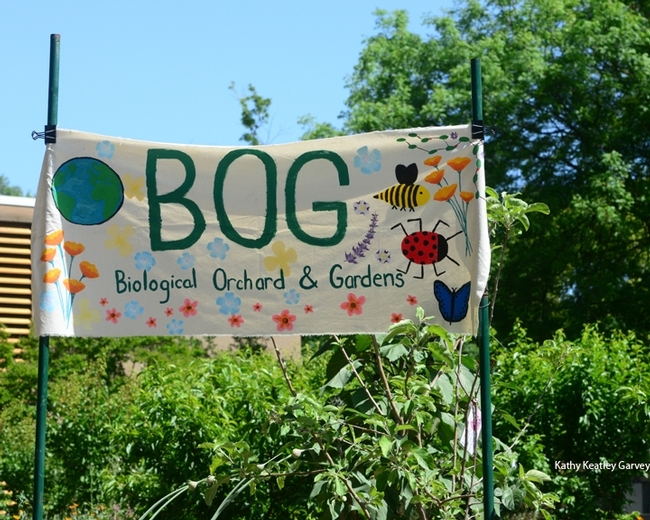 “The project began in 2010 when a group of students raised the money to convert an under-utilized lawn into a working orchard with fruits free for everyone to enjoy,” related former student project manager and now BOG volunteer Emily Dorrance. She recently graduated with a bachelor of science degree in environmental policy analysis and planning. At its core, BOG is a collaboration of students, staff and academic programs and an outdoor ecological laboratory that directly supports the university's popular Introduction to Biology course. Or, as the BOG Facebook page indicates: "An agro-biodiverse collaboration between students, staff, academic specialists and programs at UC Davis!" BOG is located in front (or back) of the Mann Laboratory on Kleiber Hall Drive, depending on which way you're going! If you park in Lot 26, off Kleiber Hall Drive, it's a short walk down the sidewalk to BOG. "The orchard you see today was planted two years ago," Dorrance noted. 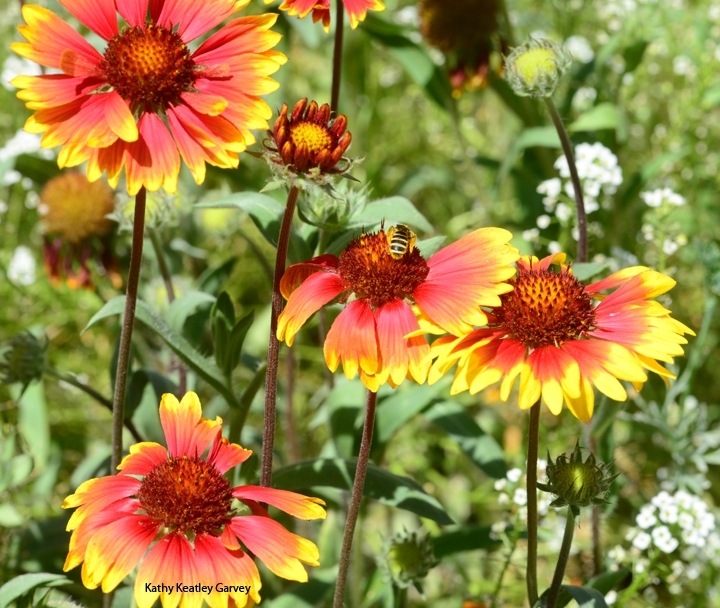 "The wildflowers were seeded four years ago and continue to self-seed, with some supplementation.We're planning on planting some more permanent plantings in the fall. The Mediterranean plots surrounding the orchard will have some more seasonal variety as well! I don't think we have any major planting plans for this summer but that could change!" --Lupine, Lupinus, native to North America. Blue: Desert bell, Phacelia campanularia, an annual herb that is native to California and endemic (limited) to California. The orchard contains heritage fruit tree varieties threatened with commercial extinction. They include the Gravenstein and Johnathan apples; the Suncrest peach; the Bleinheim apricot, the Mariposa plum and the Meyer lemon. See the full list of trees as well as some fun facts here: https://thebogatucd.wixsite.com/bogucd/single-post/2017/07/18/BOG-Fruit-Trees. Future plans? According to the website: "The BOG is joining the campuswide effort in transitioning towards a landscaping genre that embraces lawn reduction and plantings more suitable for the teaching, outreach and research mission of the university and sustainability practices. 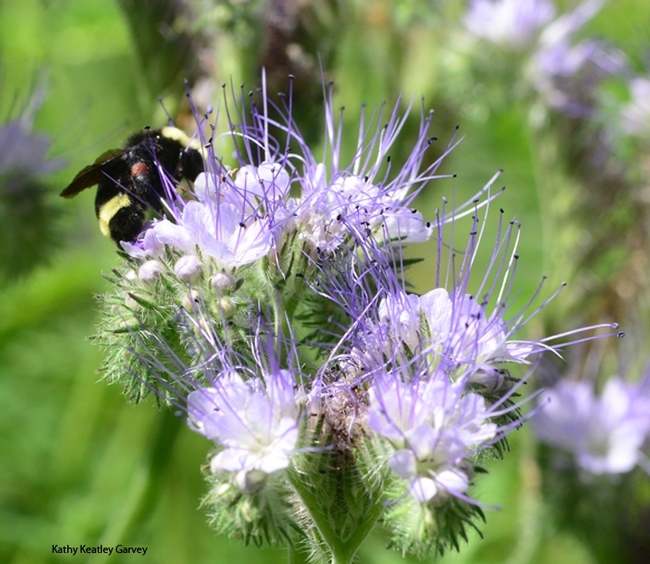 The motivation for the BOG is to serve as a teaching garden for multiple university courses and provide a relaxing space to enjoy the outdoors and simply delicious fruit. The BOG's main function is to serve a demonstration of and test site for plants more suitable to the region's hot dry summers and cool wet winters, with a focus on drought tolerant plants less commonly available in the Sacramento Valley." 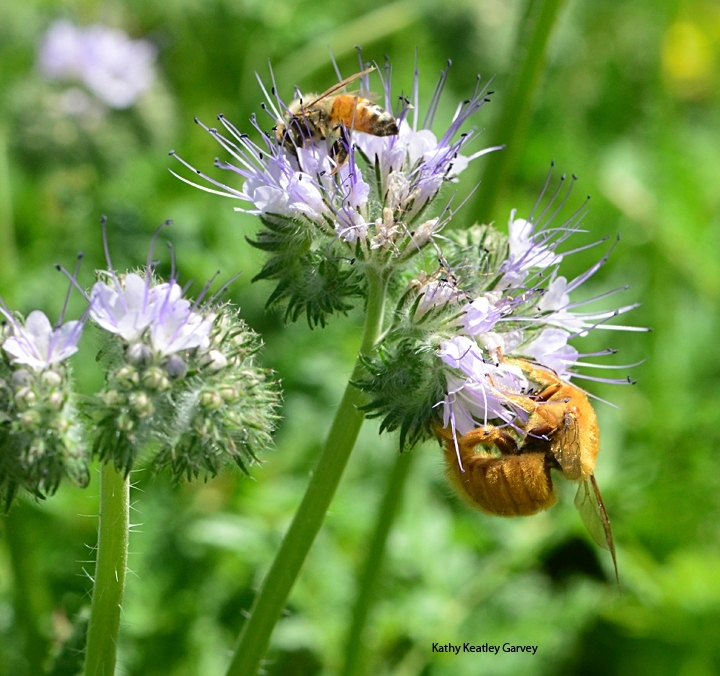 When we stopped by the BOG in mid-April, the Phacelia tanacetifolia proved to be a favorite: honey bees (Apis mellifera), male and female Valley carpenter bees (Xylocopa varipuncta) and yellow-faced bumble bee (Bombus vosnesenskii) were all over it. 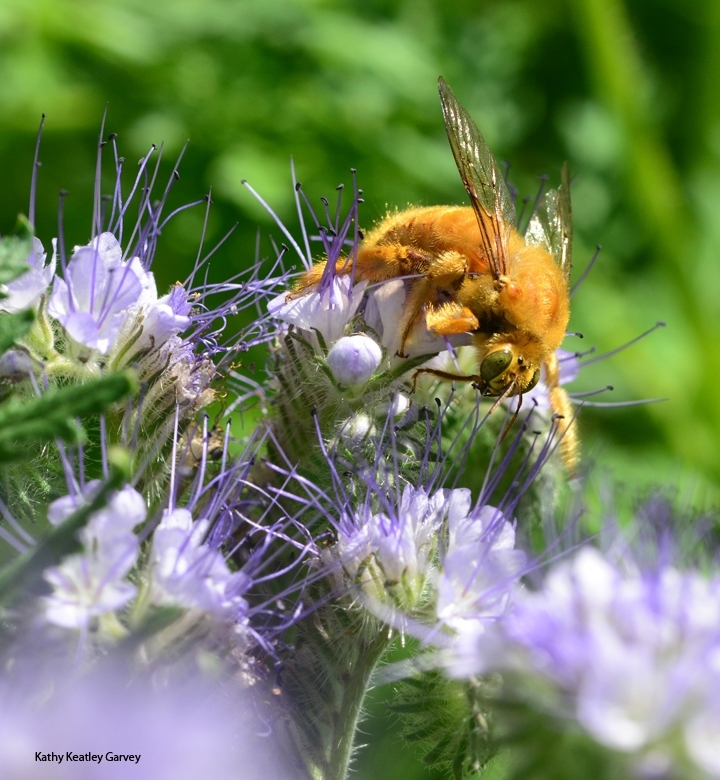 It's fairly uncommon to see male Valley carpenter bees--"teddy bear bees" or green-eyed blonds--foraging, but there they were, along with the female of the species. "The girls" are solid black in a clear-cut case of sexual diphormism. Want to get involved? The BOG seeks volunteers, interns and donors. 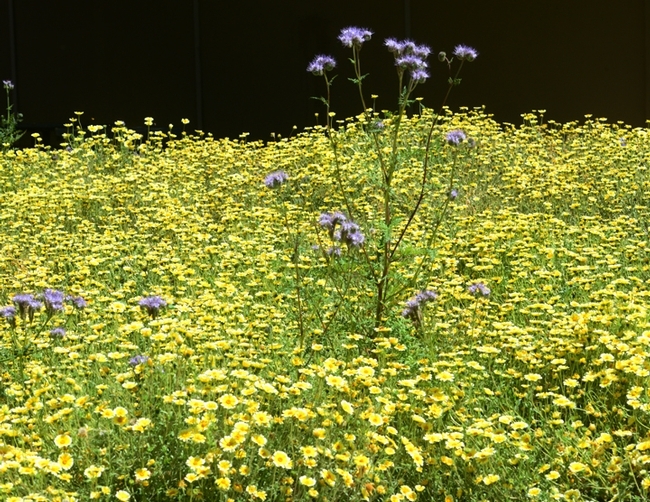 See its website at https://thebogatucd.wixsite.com/bogucd or its Facebook page at www.facebook.com/ucdBOG or email "thebogatucd@gmail.com." You can even adopt a tree! Or become buddies with a bee!